The apse is the most important part of the church as it was where the altar was located. 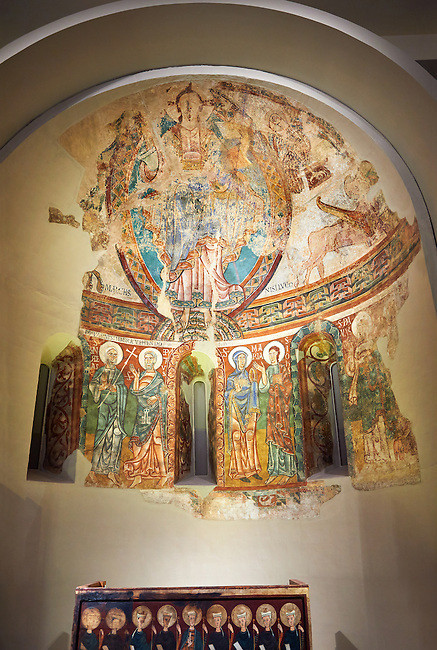 The apse of La Seu d'Urgell like most Romanesque apses was decorated with frescoes of a Theophany (referring to images of the Incarnation of Jesus).High up in the semi circular cupola of the apse is a large image of Christ in Majesty, or Christ Pantocrator, in a mandorla, a pointed verticle oval shaped aureola which surrounds the figures of Christ and the Virgin Mary in traditional Christian art. This is flanked by Tetramorph showing the four evangelical symbols - St Matthew the man, St Mark the lion, St Luke the ox, and John the eagle. In the middle register is are a series of frescoes of the Apostles and the figure of Mary. The lower register, which has not been preserved, must have been painted curtains that imitated luxury fabrics.